Medlar is the perfect winter fruit, which raises immunity, fight against viruses and protects the respiratory system. For medlar is said to be a natural aphrodisiac with branches. What are the Health Properties of Medlar? 1. The richness of vitamin C in the medlar makes it ideal to combat scurvy - disease which manifests in bleeding from the teeth and gums. Unripe fruit of medlar has a role as an astringent, which tighten the mucous membrane, and is used in the treatment of external blister. 2. If you suffer from constipation, eat medlar, because it rich in vegetable fibbers, which regulate digestion and bowel movement. Eat a few fresh fruits and you will solve the problem of a bloated stomach and stomach ailments. However, do not overdo it, because if you eat too much, it can lead to diarrhea. 3. Vegetable fiber in medlar affects the metabolism of fats and lipids and regulates the levels of good and bad cholesterol in the blood. Also, it effectively cleanses the kidneys and liver and enhances blood. 4. Plenty of antioxidants in the medlar protect cells from free radicals and damage. 5. Medlar eliminates dizziness and fainting, and acts positively on eyesight. 6. In women, medlar regulates the monthly cycle, eliminates hunger pains and nausea before the cycle. In men medlar helps in eliminating impotence and helps in prevention of prostate cancer. 7. 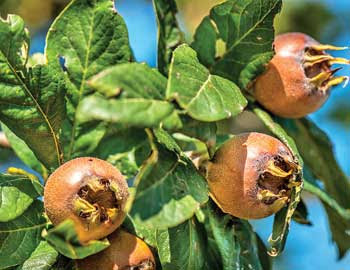 The mucus obtained from the medlar seeds is using as a coating for the treatment of various injuries to the skin, while medlar tree bark helps in the treatment of malaria. Take a tablespoon of crushed green fruit (immature) and pour with one cup of boiling water, cover and let stand for half an hour. Strain the tea and drink two to three cups a day if you have diarrhea, and in case of bleeding from the gums, rinse mouth several times with this medlar tea.